The Great Salt Lake Watershed drains a massive 18,900 square miles of land. 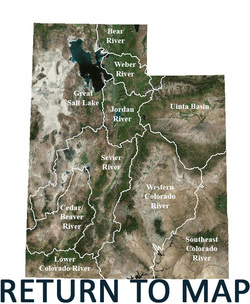 From the Great Salt Lake at an elevation of 4,200 feet, the watershed rises to an elevation of 13,000 feet. This dry watershed on average only receives 11 inches of rain per year. Streams in this basin flow very little water, except during the months of snowmelt runoff. This watershed is most famous for the Bonneville Salt Flats which cover over 30,000 acres of flat ground which attracts thousands of visitors. The majority of the land, 54%, is owned by the Bureau of Land Management. Water is used for wildlife, drinking water, agriculture, and rangeland.